The meeting was part of a ‘help each other’ initiative by the National Olympic Committee of Solomon Islands (NOCSI) and the Solomon Islands Football Federation (SIFF) played a key role organising the meeting and providing the venue. Officials from the Solomon Islands Taekwondo Federation, wrestling, table tennis, lawn tennis, beach volleyball, triathlon and football plus NOCSI attended the meeting. The aim of the meeting was for the local sports bodies to share their plans for the Pacific Games and to discuss challenges each federation is facing and how they can overcome their difficulties. Each federation presented a report of their preparations at the meeting with most sports selected for the Pacific Games mentioning that they already have teams in place that are training for the competition next year. The main outcome for the meeting is the call for each federation to formulate a written plan to guide their preparations for the Pacific Games with the plan spelling out the activities, the budget and how the budget will be financed. The federations also agreed to hold further meetings to ensure that everybody remains on track with their preparations. 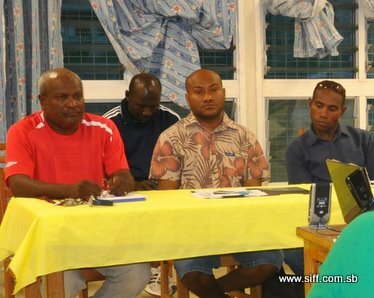 SIFF General Secretary Eddie Ngava, who chaired the meeting, said that local sporting bodies should work together because they all represent Solomon Islands. “Sharing our challenges and requirements will help us achieve a better outcome at the 2011 Pacific Games for Solomon Islands,” Ngava said. Ngava also revealed during the meeting that FIFA will support SIFF in a program intended to strengthen local sporting bodies with management as part of football’s assistance to other sports. The next meeting is scheduled for November 25, 2010.